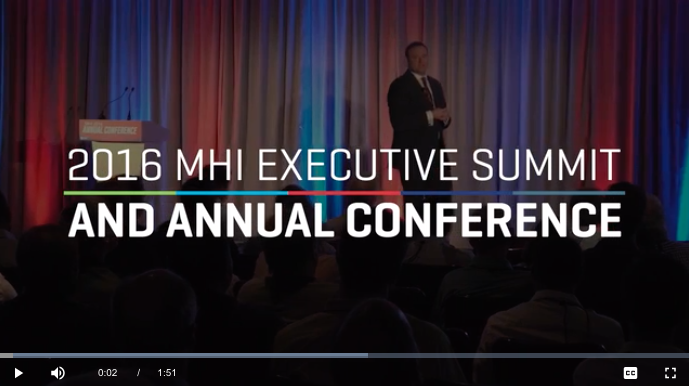 MHI view just released a new video – 2016 MHI Executive Summit and Annual Conference Recap. The 2016 MHI Executive Summit brought the theme of Accelerating Change to an invitation only, senior level, one day event (Oct 16, 2016 – Tucson, AZ) exclusively for Supply Chain Executive Leadership. The summit presented relevant and concise talks on the issues affecting supply chain leaders and a Q&A session with all speakers. With top keynotes, diverse educational sessions and plenty of networking opportunities, this year’s conference was record breaking with over 515 MHI members in attendance! View full recap of the the 2016 MHI Executive Summit and Annual Conference on MHI View. Mark your calendars for next year’s MHI Executive Summit and Annual Conference happening October 2017 in Boca Raton Florida.